It was when she was working as a dental therapist in public schools in Sydney that Michelle Irving first realised the importance of prevention. “I’d see these kids where I was extracting their third tooth because they hadn’t had the care they needed for their teeth,” she says. After a varied career spanning health promotion, clinical guideline implementation and knowledge translation, Dr Irving brings a wealth of experience to her role as Knowledge Mobilisation Fellow at the Prevention Centre. Her role is to provide support for knowledge mobilisation activities within projects, and to create opportunities for collaboration and knowledge sharing across the projects. She will begin by reaching out and collaborating with project teams to identify the many different types of knowledge mobilisation activities that are underway and/or planned, and to develop a shared inventory of activities to facilitate exchange of ideas and approaches across the Centre. She is also available to help and contribute to developing knowledge mobilisation activities as required, and hopes to collaborate with investigators and partners to develop and undertake research into knowledge mobilisation. For example, she will compare and evaluate knowledge mobilisation strategies across the Centre to better understand which ones work well in what settings, and why. Michelle says that knowledge mobilisation is already a key driver for the Prevention Centre and its projects. Early in her career, after her six-year stint as a dental therapist, Michelle worked in media and public relations for a number of hospitals in Sydney, disseminating broad health messages to the general population. She completed a Master of Health Science Education and then worked for several years as a health promotion manager. Her career then took a different turn, with her appointment as a project officer with the Centre for Kidney Research at Westmead, where she worked on implementation of guidelines for the treatment of chronic kidney disease (CKD). This work led to her PhD on the implementation of evidence-based practice for CKD. Michelle continued to explore theories and practices of knowledge translation with a post-doctoral TRIP Fellowship, followed by a series of research grants and then a research role at Sydney Dental School. There she studied Indigenous oral health and prevention of early childhood dental caries, and taught evidence-based practice in the Bachelor of Oral Health degree. For Michelle, joining the Prevention Centre is an opportunity to bring together her skills in knowledge translation theories and practices, as well as the passion for prevention that has been a driver of her career to date. “This role combines everything I learned through my PhD, TRIP Fellowship and research career, from knowledge translation theories and practice at different stages in the knowledge mobilisation pathway, through to skills in epidemiology, reviewing evidence and using technology to promote health. It means I can put these different skills into practice to make a difference, ultimately, in people’s lives, towards better health,” she says. When she’s not working, Michelle enjoys nature, travel, fine food, sport, and spending time with her two teenage children and two dogs. 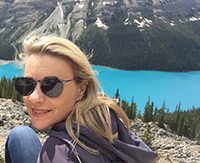 A recent highlight was a ‘bucket list’ trip she did with her US-based sister, travelling through the Canadian Rocky Mountains, where she got to see a black bear, brown bear, elk and mountain goat.